There are many different rc aircraft types associated with radio control flying, many of which you'll see at an rc flying club field. If you're completely new to the hobby and are wondering what these types of rc aircraft are, then this page will introduce you to them. For the purpose of this page, rc airplanes and helicopters have been split into their own types; simply categorising the two as aircraft types would be a bit broad given the variations available. Collectively, rc planes account for the largest number of aircraft in the hobby. Having said that, the popularity of flying rc helicopters has grown tremendously in recent years as have surged onto the scene, and the gap between the number of rc airplane pilots and rc helicopter pilots has become much smaller than it ever has been. Sport airplanes also make up a very large sector of all rc planes. They are a step or two up from a basic trainer but can also be used for training purposes, particularly low-wing training. Sport airplanes, like trainers, can be any size or shape and are more capable of performing aerobatic maneuvers than trainers are; the majority of sport planes are mid or low wing, making them better for performing such maneuvers. High wing planes like trainers, generally speaking, are not that aerobatic. Aerobatic airplanes have been designed specifically for performing advanced aerobatic maneuvers and '3D' flying. 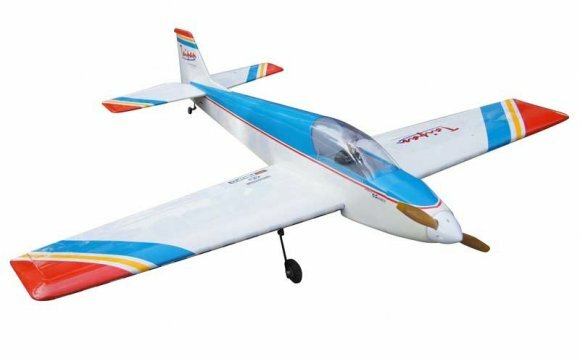 This type of rc airplane is typically mid wing with oversize control surfaces and motors (electric or nitro) that are more powerful than the airplane actually needs. Aerobatic airplanes can be thrown around the sky and flown very aggressively, so long as the pilot knows what he or she is doing! Warbirds have always been a popular rc aircraft subject; their classic lines and smooth flying characteristics make warbirds some of the nicest looking rc airplanes out there. Not particularly suitable as an absolute first model, although there are some RTF warbirds available that have been developed with the beginner in mind. The term warbird describes a plane that was used in war, notably the First and Second World Wars. The P-51 Mustang, Spitfire and Corsair F4U are classic examples.